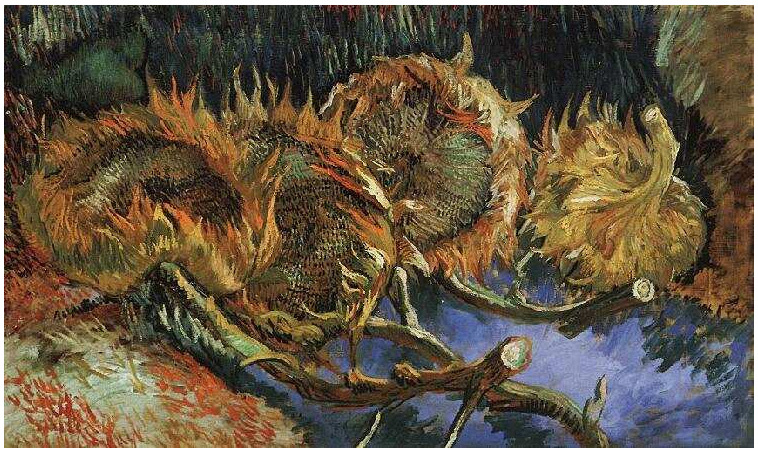 Four Cut Sunflowers by Vincent van Gogh. Adding to the skill set as a writer takes a lot of practice, but it can be done. I recently had to give up all caffeine — coffee, decaf, and tea, plus limit my chocolate. Ouch, that last one hurts. At first it seemed impossible. I was so groggy in the morning. Ginger plus a lemon ginger, yeah double-barreled ginger, did a good job of raising my eyebrows every morning. Then I found a nice cocoa tea. It had a teensy bit of caffeine, but not enough to cause me problems. After two months of caffeine free, I noticed something remarkable. I could drink any herbal tea in the morning. I don’t need it to wake up. The afternoon crash doesn’t happen anymore. I’m more awake without caffeine than I was with it. Learning new writing skills works similarly. Conscious effort goes into it at the beginning. After time, it becomes more ingrained. I find some become part of my repertoire easier than others. Some new skills work out great, some not so great. I noticed some rules, if I used them too much, took away my voice. So I eased up on those. I.e., writing without any form of the verb ‘to be’. It made me sound mechanical. Striking a balance improved my writing and retained my voice. So I chose balance. Outlining extensively from the beginning doesn’t work for me. I did find a compromise, though. Why? I can write faster and keep the story on track better. Before I start, I write a tagline, a rough blurb, and each of the main characters’ arcs. Those bits are written on the page before chapter 1. If I can outline the next 2-3 chapters with quick sentences, it can also help me write faster and better. So I now incorporate these tools. I find reading a really rich writer’s work helps me improve my writing too. It inspires me, and I’ll work to emulate what I like about his/her writing. It’s always good to stretch our writing muscles. One bad habit I constantly have to keep my eye on: I’m a recovering that-aholic. Do you have a writing nemesis like ‘that’? What would you like to improve? Being more organized from the start is still new for me. Character and emotions are something I always strive to keep upping the ante on.